The main parking is on the street. Besides that guest can park in chamber street which got huge parking space, next road to Forrest Road(front of Scottish National Museum). 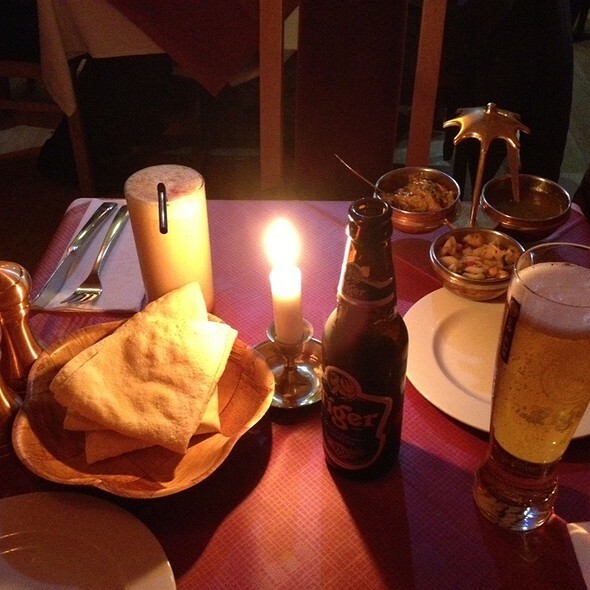 Namaste Kathmandu is located in heart of Edinburgh city. its is just 10 minutes walk form princess street and high street. There is 24/7 buses facilities and there is bus stop just opposite to Namaste Kathmandu. Namaste Kathmandu restaurant is a family friendly fine dining restaurant. Namaste Kathmandu restaurant plays its own typical Nepalese and Indian music while opening hours to enhance the dining experience. we also provide colorful pencil and paper for kids so they can enjoy while dinning. Namaste Kathmandu has a private room which can accommodate up to 35 people at ground floor with music system and attractive decoration. We are pleased to introduce you to a new taste that is reflective of unique Nepalese and north Indian cuisine. Born in the mountain of the Himalayas. north Indian and Nepalese cookery has become a favorite style of food throughout the world. The cuisines of Nepal offer a whole range of mouth-watering recipes to the adventurous connoisseurs. Every region of these vast nations has its own favorite ingredients,flavoring and methods of cooking and the variety of dishes are extensive. Having created our own history in Edinburgh by serving Nepalese and northern Indian food under one roof, Namaste Kathmandu is where you can have quick and wholesome meal or a full course dining. You will find things you need, right down to the appetizer and drinks, to capture the flavors of Nepal and its neighbor. Our chef"s team have many years of experience in preparing exotic and signature Nepalese and Indian dishes. Dumplings filled with minced chicken or vegetables flavored with fresh coriander leaves served either steamed or fried. Quarter chicken marinated in yogurt & rare spices and barbecued in earthen clay oven, served with peas pilau rice on side and mint sauce. Fish fillet battered with Himalayan spices and dip fried, served in a bed of onion bhaji. Smashed Veg. Samosas top with indian spices and a squeeze of lemon juice. Sprinkle with chilli powder, cumin and chaat masala over the yoghurt. £6.95; Vegetable – Chicken – Lamb Curry served with Rice or Naan bread. Barbecued boneless chicken cooked in a chef's secret blend of spices. Enjoy one of our traditional Thalis. Thali is a selection of different dishes, served with small bowls fixed on a tray. We serve on our own authentic metal tray as you might see in the Himalayas. All Thalis are served with veg pokora, side seasonal vegetable or lentils, green salad, rice and naan bread. Chicken curry cooked in a chef's secret blend of spices. Lamb curry cooked in an Indian herbs & spices. King prawn curry cooked in an Indian herbs & spices. Great food. Attentive and accommodating staff. Bookable during the Fringe. Only reservation is that the veggie main dishes are slightly pricey for what you got. I'd definitely come back if back in town. We were very disappointed by the quality of food. 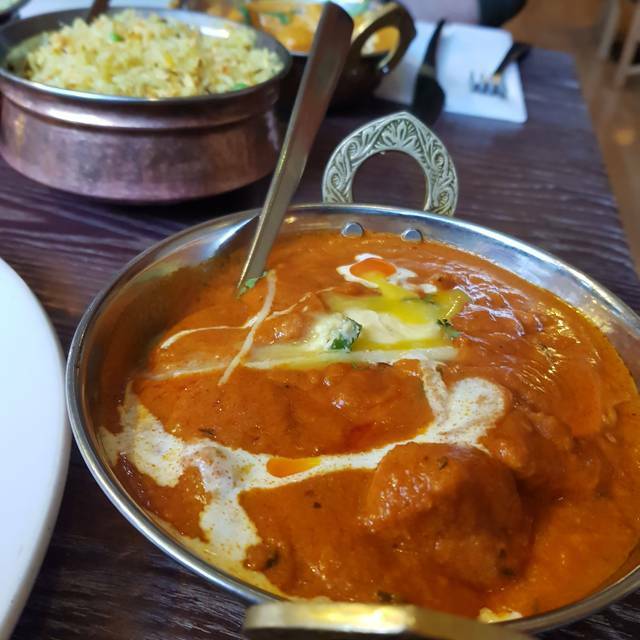 We have eaten at many Indian restaurants in the UK and US and this was the worst food in terms of taste. They charged several pounds extra for things that are normally included: rice, pappadums, and even sauce for the pappadum. Our bill was very high as a result. Food was quite good. However, the server patronized us. We ordered two main dishes and asked for them to be prepared as spicy. One of the dishes seemed blander than the other. Without telling us, our server had the blander dish prepared with medium spice rather than spicy without telling us. He revealed this to us as he cleared our dishes. We were not happy. If the server was concerned about our choices, he should have consulted with us when we order and let us decide. Treating us like children with such sneaky behavior is unprofessional at best..
Just a word ...go for it....delicious food. Service was perfect, waiters are nice and they take time to explain. Went there for a special occasion with friends 6 of us alltogether, the service was fantastic, very friendly, attentative and customer focused. The food was really good especially if your looking for a change, I would go there again without hesitation, we had a really good night. Make sure to ask for traditional Indian or nepalese food (if you're into it) because they change I their courses according to the UK standards.... lot of added sugar, which is not necessary! The food was fine, service very friendly, and the restaurant is useful for relatively late in Edinburgh - though they advertise bookings at 11pm, which I reserved for, but they telephoned to tell us that last orders had to be before 11. Hmm. Nonetheless they were helpful and welcoming. Booked online but phoned ahead before arrival to alter the time, which was accommodated without issue. The food was excellent with a notably extensive menu of vegetarian dishes as well as meat. It also has a split menu between Nepalese and Indian, allowing the opportunity to try new things while having plenty of old favorites to fall back on. Trying the Nepalese dishes for the first time was a revelation; very fresh ingredients and interesting flavours. Highly recommended. Have been a number of times before so thought I would introduce friends to Namaste. I was not disappointed and my friends were suitably impressed. Booked at the last minute, for dinner with our children. The staff were pleasant, attentive and helpful. The food was good, and the ambience very good. A little expensive overall however. Booked for dinner on a busy night, and did not have to wait even though the restaurant appeared full. Service was OK and friendly and the food was nice except for being served a frozen samosa! True it was replaced with no fuss, but they didn't take it off the bill. The menu has gluten and dairy - free options. Food was delicious and a good selection of vegetarian options. We managed to get a short notice booking during the Festival and the restaurant was very busy but the staff were still attentive and the service and quality of food excellent. We will definitely be back. The meal was nice, service was fast and the price was good. It was busy festival time, good buzz, but would have been good to have known that we only had a set time at the table (an hour) before we were advised the table was needed. Apart from that great place! During the festival this restaurant is in a really good position , close to many Fringe venues. The restaurant is simply decorated but clean. The cooking was good , slightly disappointed that there were so few Nepalese dishes. The food here was delicious -- creative presentation and stellar ingredients. The service was some of the best I have ever had; our server was knowledgable, unobtrusive, and helpful (and she knew about wine!). I loved the hip, casual aesthetic of the restaurant. Very nice evening, everything was cooked perfectly. Complimentary valet parking was a real bonus. My wife can't eat warmed-up food as she has a Hystamin intolerance. We are not sure, whether our Food was precoocked and reheated, but for sure she had a difficult night after dining in the restaurant, which means that something was not fresh fresh fresh. Delicious food and although had to wait a bit for it to arrive, well worth it. Some of the best Indian vegetarian food I have eaten anywhere. Staff were very kind as we were a big group! Extremely good value and would highly recommend. Special occasion and it was a lovely evening. when we arrived we were taken to her seats, it was very busy as during the festival, service was prompt, and we were well attended. food was lovely and well presented. Delicious flavours, and portions adequate. would definitely return. Great Indian food - an interesting menu and really well served - very tasty. Only issue with the restaurant was that we booked through OpenTable but when we turned up they did not have a table for us and we had to wait 20 minutes to be sat. They were apologetic, but they had just given a table away to someone who had not booked, so not sure they refer diligently to their booking information. One of best Indian food we've ever had. Service was very attentive and discreet. Food was awesome. I especially liked the Nepal items on the menu. Everything was delicious. We would definitely be back. Definitely recommend and want to go back! We arrived here on the basis of great reviews online. I would like to add to those great reviews. By the end of our meal I seriously wanted to sneak into the kitchen to find out how they were making everything taste so delicious - I am a keen cook at home and if I could serve up even one of the dishes we tasted I would be a happy man! I recommend this restaurant to foodies - both veggie and non-veggie (I like the fact that the phrase 'non-vegetarian' is used on the menus). Expect to be delighted. Expect to be well looked after by the serving staff. Expect to have a great restaurant experience. This was a good choice of restaurant for a large group we were looked after very well by the team in store , service was very good and efficient and our meals arrived promptly to enable all the group to eat a hot meal together. The menu was varied and the dishes are explained as to content and spices used, all the meals were cooked to a high standard all very flavoursome and some the best people had eaten especially the Chicken Jalfrezi and Crab meals. I would recommend this restaurant to anyone visiting Edinburgh in a large group who want to eat and enjoy a good meal. 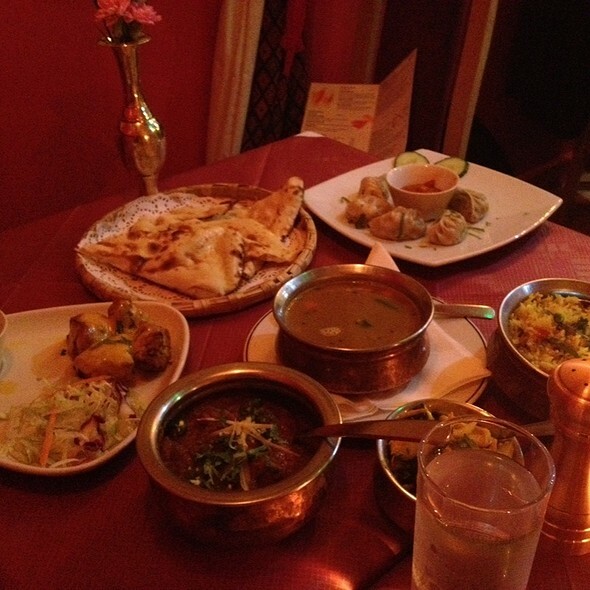 Really good selection of Nepalese and Indian food. Tried some really special appetizers during dinner, all the flavors were really unique and didn't blend together the way I think things like curry tend to. Love the chef, whomever he is. Recommend any of the marinated lamb highly. Was worried about booking online but everything went really smoothly and they set out a lovely table for us. Would eat here again and again. Excellent warming feats that set us up after the pouring rain and wind. A wonderful evening and good service. The food is excellent but be careful its easy to order too much especially if you don't eat a massive amount like us. We shared a starter and then the rice with our main courses and it was more than enough to go along with an amazing bottle South African Pinotage! Very enjoyable meal with excellent, friendly service. Loved the ambience and the food was amazing. Every dish served to the 6 of us was so tasty and fresh. Service was efficient and friendly too. Love it! Nepalese dishes mixed with Indian ones. Decent food. Service could be better. Those who mentioned grumpy manager were not exaggerating. This guy embodies service without a smile. Service was very quick, food was good but nothing much to rave about. Draft beer seemed suspiciously watery. Ambiance is non existent. So if you fancy a quick Indian in a break between festival shows it is a good choice. Otherwise I would probably avoid. Tasty Indian fayre in a handy location for the festival. Don't expect anything too creative.